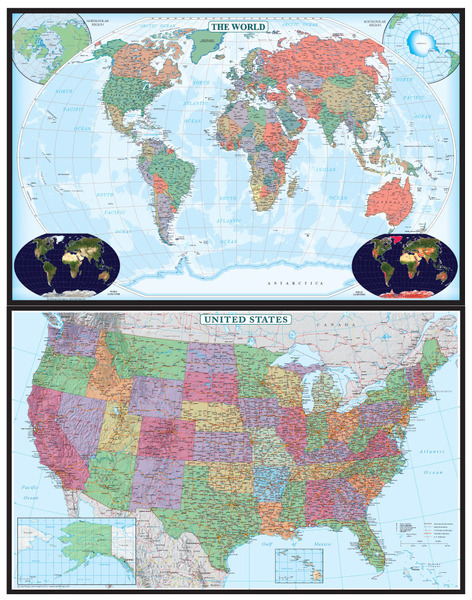 One-Sheet United States and World wall map available laminated, railed or spring roller. This is a one-of-a-kind United States and World combination wall map. 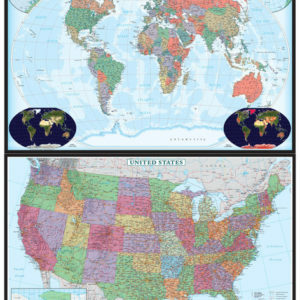 Unlike most maps, this wall map includes both the USA and World on one sheet for easy viewing in limited space. Map is printed on latex and laminated for durability and dryerase use. The combo is available laminated, mounted to wooden top/bottom hanging rails or attached to a classic springroller mechanism for retractable use when not being used. Map is extremely detailed and was created to be used in a educational setting but is just as effective for business and boardroom use. Map can be pulled down only half way to expose only the World map or can be fully extended to feature both. Who needs two maps when you can only have one? 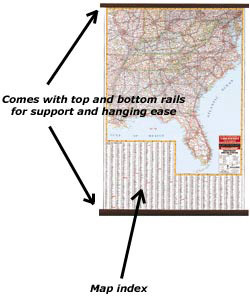 Swiftmaps.com is proud to offer our very own top line of framed wall maps. We offer eight of the best selling finishes for your wall map and have made them available with many of our popular wall maps. All wooden frames are hand made in the United States by professional framers. They include all mounting hardware for easy hanging. Swiftmaps.com’s line of wooden frames are 1 1/2″ inches wide. We have found this to be the most popular size for wall maps. All framed maps are first mounted to a heavy duty foam/cork board then sprayed with a professional protective coating to give your map an extra layer of protection from dirt, oils and moisture. Custom decorative framing and non-glare glass are available for special order on request. Please contact us for custom requests. If you want it, we can make it!! Email us at [email protected] with any questions.